The epic saga that is Game of Thrones is finally coming to an end this spring after what will be the eight and final season. The Stark children were young, innocent kids, Ned was still alive, the dragon eggs hadn’t hatched yet, and I was barely out of college. For many of us Game of Thrones has been there with us side by side through some of our core, millennial adult years. We matured with Sansa, became comfortable with our own sense of self with Arya and grew the confidence to stand up for integrity and humanity with Dany. Now, nine years later, they are grown and so are, we, with opinions, emotions, and plenty of worry lines to show for it all. With nuggets of wisdom collected from Westeros to Winterfell and even beyond the wall, here are ten life lessons we learned from Game of Thrones. Women have to fight to get what they want. Dany breaks chains, frees people, raises dragons, and inspires both women and men to follow her across the seas to take back the iron throne. Cersei defeats anyone and anything in her path to hang on to her power and to the select few she actually loves. Like her or not, she knows how to get what she wants. Margaery, may she rest in peace, managed to work her way through three “kings” and reign as queen. And then we have the little wolves. Arya and Sansa started as bickering wolf cubs, scrapping with one another and pursuing their own self-interests. They went their separate ways and fought every single day for survival, for the skills to learn how to play a game they weren’t raised by their decent and diplomatic parents to play at all. The women of Game of Thrones are fighters, survivors, and examples of the battles women have to beat to take charge and make their way in the world. Sure, maybe murder is a bit much, but it’s all relative in the Seven Kingdoms. Femininity does not equal womanhood. Arya Stark may have been forced to masquerade as a little boy for a stretch of time during her journey, but she’s still proud to be a girl. She’s just not a girl by the expectations and standards of some of the people around her. She fights, she kills, she prefers swordplay over dresses and running over sewing. Brienne of Tarth is a sworn swordsman to several honorable lords and ladies. She doesn’t like dresses either. She’s mocked for her masculinity and doesn’t like to be called a lady. She’s strong. She’s a warrior. She’s far from feminine. And she’s fabulous. The definition of women is not limited to femininity, it also encompasses the androgynous, the masculinity, and the fierceness of all women. Catelyn Stark followed her son into war, and they both died for it. Dany lost a child at birth and became hardened. She gained three baby dragons as her children and became indestructible, fearless and intolerant of hatred and oppression. Early in the series, Cersei tells Sansa Stark that loves makes you weak, but that a mother cannot help but love her children. All of the hateful, despicable, maniacal things she does, in her eyes, are out of a mother’s love. Although we can’t relate to all of the genocide from Cersei, motherhood does change your perspective on life. It makes you defensive, protective, defiant and patient when it comes to who you let into your circle of trust. Walls can’t keep the real danger out. It seems serendipitous that a show that so heavily features a daunting, monstrous wall that is meant to separate people and pit them against one another is actually building up to a war in which the living need to all work together to fight the dead. No matter what side of the wall you were born on, or what kind or god you serve, no physical structure can separate the fact that all humans are still humans and have more in common than they have differences. The Wildlings and the members of the Night’s Watch eventually figure that out, and hopefully we all will too. When you drink wine, you also know things. You can’t blame life’s problems on the alcohol, but you can use it to get those brain cells to relax and get the real ideas flowing sometimes. We can all use a glass of wine after a long day. Tyrion Lannister drinks wine and knows things, and we love him for it. After a long day of working and momming, or studying and anything else that falls under the umbrella of grown-up responsibilities, a little wine inspired reset button never hurts. A glass of wine a day can sometimes keep the stress away and make room for the things that really matter. The only way humankind can succeed is to work together. Now that we’ve agreed that humungous walls are garbage, let’s also establish the fact that teamwork is the only real way to unite against a common enemy. We’ve spent seven seasons watching a few people with massive egos kill millions of people over the right to wear a crown and claim a kingdom when in reality, they’re all going to lose if they don’t come together. If the threat of a giant frozen zombie army isn’t a lesson to mend fences, forgive and forget and fight the war of existence and world preservation to save the living, I don’t know what is. Whether it’s a zombie army or, you know, climate change, chances are we should probably pull it together. Always hold on to your wolfpack. Say what you want about the Starks. Cold as ice, too benevolent, too naive, too cocky. The family and its members might all have had their flaws, but they never stopped trying to find each other. The dire wolves they adopted in one of the earliest episodes of the series continue to manage to find members of their pack when they’re in distress. We could all learn a lesson from the wolves to stick together and to swoop in and protect your own without question if someone from the pack needs saving. Books are just as sharp as swords. 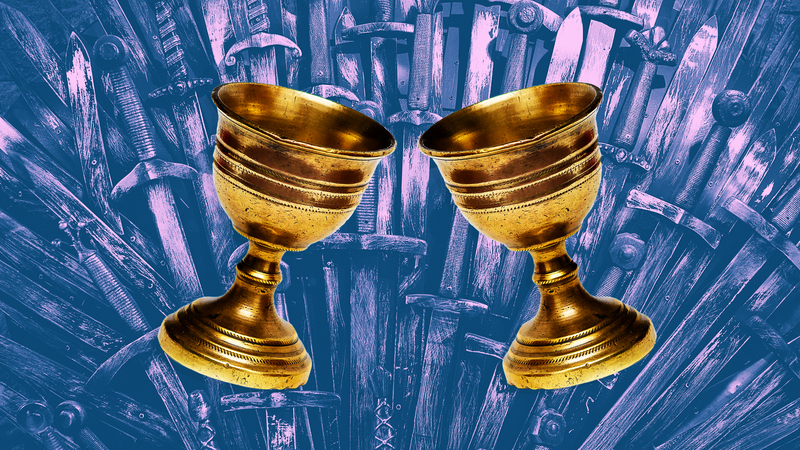 Two of the most brilliant characters in the Seven Kingdoms win wars not thanks to the sharpness or their swords, but instead with the knowledge they have gleaned through studying and reading. Sam and Tyrion can attest that knowing exactly the finest details and remember the seemingly most minor facts can be the difference between life and death. Not to mention a duel of wits is much more stimulating than a lance and a shield. It never pays to be in debt. Whether you owe a few outstanding credit card payments, have a seriously flawed mortgage, or simply just owe a Lannister some gold, it’s never worth it to be in debt. To owe someone means that you are constantly waiting for them to cash in a favor. We all want to live life on our own terms, spending our money as we please feels like a decision we should get to make for ourselves. Life is better when we aren’t indebted to anyone, especially the Iron Bank or the Lion sygill. We all know nothing, Jon Snow. We learned lots of valuable life lessons while watching Game of Thrones, but the biggest one is perhaps that we really know nothing at all. If Ygritte’s famous words of wisdom taught us anything, it’s that we all have so much to learn. Loving with an open heart, living with an open mind, and never thinking your existences trumps someone else’s are really the only things we know. Everything else, we’re more than willing to learn, and hopefully the final season of Game of Thrones will teach us.